Next week, tens of thousands of entrepreneurs, investors, policymakers, corporate leaders, technology experts, and others will gather in Lisbon for Web Summit, the largest technology Conference in the world. Lots of cities dream of hosting such a major event, and many of them build fancy convention centers to try to attract one. Visitors fill up hotels and restaurants, and public coffers fill up with revenue from sales taxes, lodging taxes, and so on. Skepticism is warranted. In recent years, doubts have grown about whether cities actually get value from playing host. In sports, for example, there has been a steady decline in the number of cities wishing to host the Olympic Games. Financial costs of big events can be greater than the fiscal benefits. With a conference like Web Summit, a clear objective is to create collisions between startups, investors, and others so they share insights and forge relationships. Literally bumping into someone in the line for coffee, or tracking them down through a conference, can’t happen over long distances. So, is it true? Is a giant conference like Web Summit good for Lisbon and its startups? The answer is … yes, and we at Startup Genome can answer it using our trove of assessment data, particularly the metrics behind an ecosystem performance factor we call Global Connectedness. 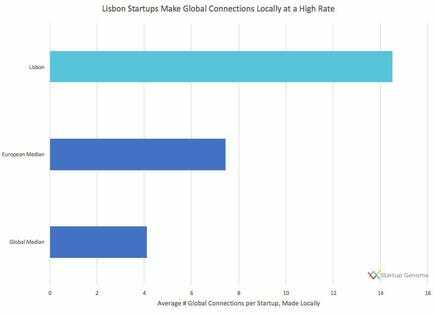 Web Summit boosts the ability of Lisbon startups to build Global Connectedness, which helps them sell to global markets at a greater pace than startups elsewhere. This leads to faster startup growth and stronger overall ecosystem performance.